Tristan Rice, of Sabillasville, is a sixteen-year-old junior at Catoctin High School and an HVACR/Plumbing student at the Frederick County Career and Technology Center. This busy student is also a dedicated athlete who throws the shot put during the school year for the Track and Field Team at Catoctin, and works out several times a week at Anytime Fitness in Thurmont, honing his powerlifting skills and increasing his strength. Tristan recently set two national powerlifting records and an unofficial world record. His national records include a 502.6 lb. squat and a 510.4 lb. deadlift recorded in the USPA 16-17 Year Old 275 LB Weight Class and his world record was in the IPL 15-19 Year Old 275 LB Weight Class. 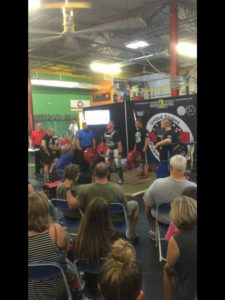 The Records were set August 18, 2018, at CrossFit Frederick during the Maryland Drug Tested State Championship meet. Tristan is traveling to Las Vegas for the IPF Drug Tested World Championship where he will officially compete for two world records in the squat and deadlift.